← A tame Bluethroat on Fair Isle. Discovering the apparent Pale-legged leaf Warbler. If you put any serious amount of time into looking for scarce or rare birds you, like me, probably daydream about the circumstances that may surround encountering one. Will it be half way down a windswept cliff on Fair Isle, flit across in front of you whilst walking a quiet lane on Scillies, or perhaps a just reward on your local patch. I often muse upon all the above scenarios but what happened on the 21st October 2016 has never been one of them. That is being handed a dead Pale-legged or Sakhalin Leaf Warbler whilst holding a cornish pasty in the other. Either way, DNA testing will make it the first proven record for not only the UK but the entire Western Palearctic region. 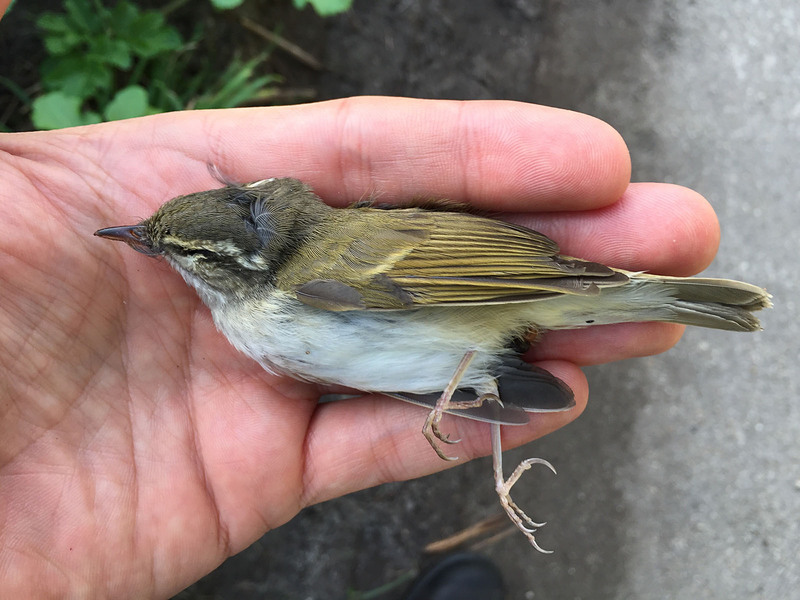 Pale-legged or Sakhalin Leaf Warbler. Around midday I was scoffing a pasty outside the St Agnes lighthouse, with house mate Jamie Partridge when owner Fran Hicks came over for a chat. We all bemoaned the poor bird situation on the island. 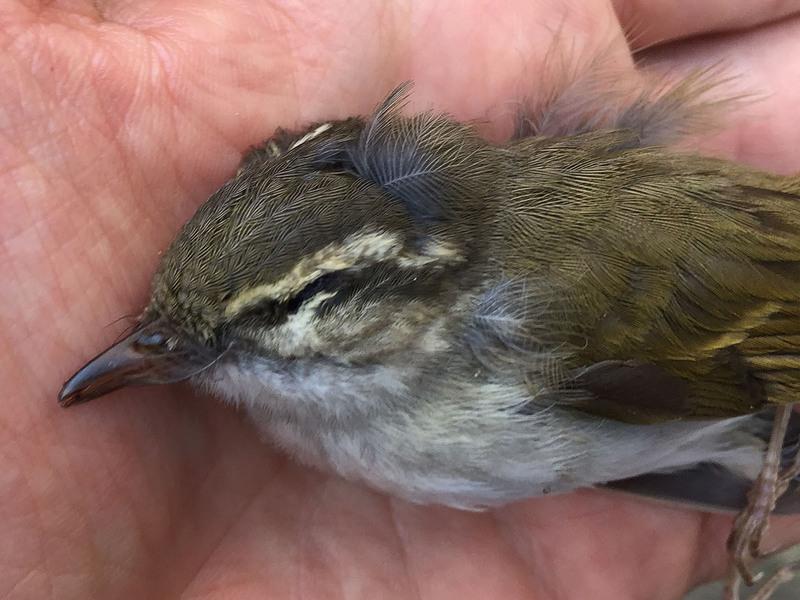 In parting he commented that one of the Yellow-browed Warblers, which had been frequenting the garden, had sadly struck his conservatory window and died earlier that morning. As he turned away I hesitated in asking to see it but managed to blurt out the request before he disappeared back into the garden. He quickly reappeared with the Warbler, holding it by the leg and placed it into the palm of my left hand. Immediately I realised the bird was not a Yellow browed and my thoughts turned to Greenish/Arctic Warbler. I quickly dismissed Greenish and thoughts turned to Arctic Warbler but something wasn’t right. I couldn’t reconcile the primary projection and the bill seemed odd but admittedly I was over looking some obvious plumage features. I was concerned that birds (especially smaller ones) can look very different in the hand than in the field. Something was limiting my thought process and at this point Pale-legged & Sakhalin Leaf Warbler were not names I was thinking of. I decided to circulate images hastily tweeting the photo’s with “Arctic Warbler?” as a marker in the sand. Almost immediate several people responded (notably James Gilroy, Chris Batty, Andrew Holden and many others) with very different suggestions! Andrew was both on site and clued up enough to check wing formula and go through some other features to confirm Pale legged/Sakhalin Leaf Warbler. DNA testing will make the final call between between the two. This clearly isn’t a conventional “bird find” more so a cooperative effort by the wider birding community and I thank those involved. All the same, it was a unique event to be involved in and I wonder how close the bird went to going unnoticed. The breeding range of both candidates are between 7500km – 9000km from Scilly. 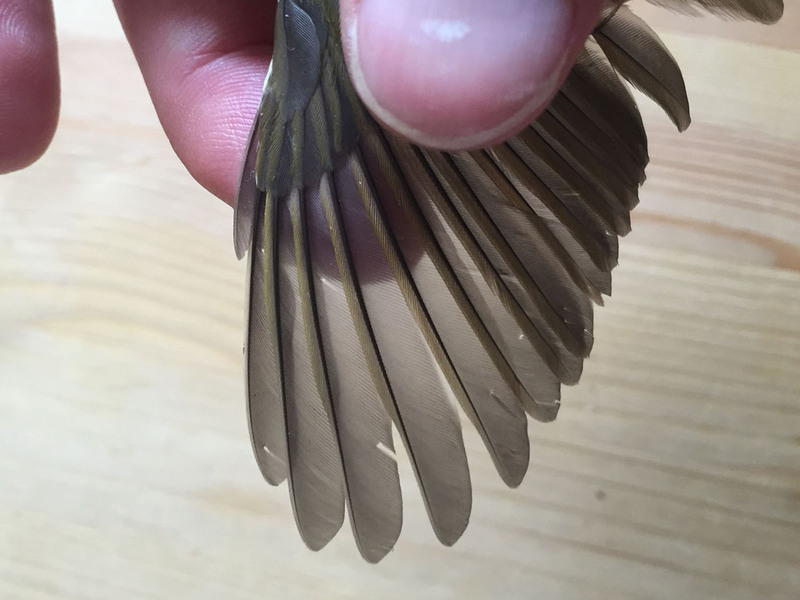 Showing the length of the first primary feather. 2 Responses to Discovering the apparent Pale-legged leaf Warbler. Aw. My first encounter with a Yellow-breasted Chat was also with a bird-strike casualty. Glorious detail on the wing and a beautiful bird to behold there, even if he didn’t make it.